Renowned for its majesty and nicknamed "the king of the jungle," the lion possesses both beauty and strength. Lions vary in color but typically sport light yellow-brown coats. Mature male lions are unique among big cats due the thick brown or black manes that encircle their necks and protect them while fighting. Though lions used to live in most parts of Africa, they are now found only in the south Sahara desert and in parts of southern and eastern Africa. 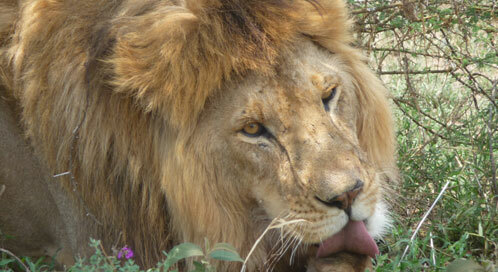 Historically, in addition to Africa, lions were found from Greece through the Middle East to northern India. The only social member of the cat (Felidae) family, lions live in large groups called "prides," consisting of about 15 lions. Related females and their young make up the majority of the pride. A single male, or sometimes a small group of 2-3 males, will join a pride for an indefinite period, usually about 3 years or until another group of males takes over. Young cubs are vulnerable to predation by hyenas, leopards and black-backed jackals. The cubs begin hunting at 11 months but remain with their mother for at least two years.